1. Download and extract the “where-ive-been” folder. 2. Upload the “where-ive-been” folder to your WordPress plugin directory, usually “wp-content/plugins”. 3. Activate the plugin in your WordPress admin panel. 4. *Optional* If you wish, you may hard code your user id’s into the where-ive-been.php file. I only recommend doing this if you know what you’re doing. 5. Place the shortcode with the required values filled in wherever you wish for your map to be displayed. See usage for more info on how to configure the plugin. To update the plugin simply use WordPress’s built in one-click updater. If you wish to upgrade manually simply repeat the installation steps. Before you can embed the map on your blog, you will need to retrieve two user id’s found in the source code of your whereivebeen.com profile. 1. Go to http://www.whereivebeen.com and log in to your account. 2. Click on the “Profile” or “My Profile” buttons to pull up your map. 3. Right click in your browser and select “View Page Source”(Firefox), “View Source” (Internet Explorer & Safari). 4. Search the code (CTRL-f Windows, Command-f Mac) first for “uID” and then for “iID” and record each of the corresponding values that are single quotation marks. You are looking for the values that are represented as 0’s in the example. The uID will be around 8 digits long and the iID around 32 digits. The plugin makes use of WordPress Shortcodes and has two required options and two optional ones. 1. uid = *Required* Your unique 8 digit uID found on your whereivebeen.com profile (see above). 2. iid = *Required* Your unique 8 digit iID found on your whereivebeen.com profile (see above). 3. roundcorners = Optional. This option can be set to either ‘true’ or ‘false’, the default is ‘true’. This option will change the corners on the map window to either round(true) or square(false). 4. width = *Optional* Set the width if the default (570×360) is too wide for your blog. The height is automatically calculated. Click the screenshots to load them in the lightbox. Can I use multiple maps on my site? You may use multiple maps by using multiple shortcodes with different user id’s. Does this plugin work on pre-2.7 WordPress installations? I have personally only tested the plugin on WordPress 2.7+ installations. The plugin makes use of the Shortcode API that was released in WordPress 2.5, so it will possibly work on all versions after 2.5. If your feeling brave, test it out and let me know. Here is what I have planned for future versions. Implement WordPress Admin Panel control. I’m not a programmer (but I can try to fake it). If anyone wants to help add new features, clean up code, or help support the plugin leave a comment below. I may not be able to answer your question or solve the problem, but collectively we can. how do you get “My Locations” to show on the map?. Every thing else works ok.
What a great plugin, I was looking for a easy but neat way to show my visitors the places I’ve been. This way it fits right into my blog. Just trying out the plugin and noticed the download link has an inverted comma ‘ at the end of the link. The link works when that is cleared. Thanks for the info, I fixed the problem. I developed the new map for WIB. A new version will be soon available and this plugin will not work for very much longer. Ed, I will be sure to update it once the new version is released. Do you have any suggestions as to what changes should be made to make it compatible with the upcoming version? The map loads up OK but doesn’t show my locations. I have copied the uID and IID correctly. I have the same problem as AJ in which my map will load but none of my locations are listed, only a blank map. I switched from the shortcode to pasting the php code into a page (which I had copied and edited from another person’s website to make sure it wasn’t the file I downloaded’s fault). What can I do? Thanks! My plugin has stopped working and I notice the demo map of your plugin page is not working either. Have Where I’ve Been changed something at their end to stop it working? Where I’ve Been changed their map code. I’m working on updating it if possible. I sent them an email weeks ago, and never heard a response from them. I shall try again and see if they are will reply. Did y’all ever figure out the problem with the switch in the WIB code? If you’re still interested in getting this going again, shoot me an email. I’m at a point where I can help out. I have all of the flashvars and their values needed to get it going again (at least if they haven’t changed it since April 09 — which it doesn’t look like they have). @Coder: I received word that WIB is releasing an API that might help with the process. I’m not really sure what has changed from the previous versions, so maybe what you have is still useful. You can check out information regarding the API here: https://developers.whereivebeen.com . I’m interested in getting it working but really am not a programmer so any assistance would be appreciated. Take a look at the API site and see what you think. Thanks. The WIB API would be overkill for simply displaying your map via your plugin. Let’s take this off this thread if you want to continue. Any progress on fix, This plugin looks good for my site. @Kevin I managed to get a version partly working on my website (see above). I will be doing some bug fixing and plan on releasing a new version shortly if things work out. woot awesome news mate. Well done!!! Hey Nic, awesome site and great idea on the Where I’ve Been plugin! Any updates on the plugin or any ideas on how I could make the fixes you made to get the plugin to work on my site? It’s possible to insert a map into a blog. I used Firebug plugin for Firefox to view the source. I logged in as another person and added myself as a friend. Then looked my (original me) source code using Firebug of the Whereivebeen map and copied to my blog. My wound is slight, and it will heal quickly. His wont, ever. The strongest survive. You are a strong one, Korath, and quick-sighted. So you survive. If you had not seen these bears, perhaps you would not survive. For I wish to stay here a while, to explore these ice-castles, and blood and flesh are the fuels I burn. If not the flesh of bears, what then And his red eyes gloomed on me. Does this plugin still function? 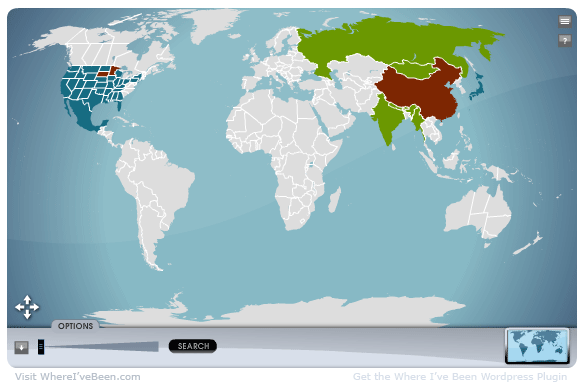 It shows up on my blog, but the map does not ever load. I have a password protected site, but that should not matter. Any help is appreciated. Is this pluging working? If it isnt working on you own site I doubt it? Is this plugin still being worked on? I consistently had wrong locations on my about page and sidebar while traveling from 2010 – 2012…and we built Oh Hey World as a result. One of the things we’ve built is a wp plugin that makes it super easy to keep the “currently in” component of your site up to date. They have changed the website enough that this plugin will no longer function. I don’t anticipate working on it in the future. Got it. Well if anyone else in future is interested in a solution for this, let me know. It’s something we’ve thought a bit about addressing.